I looked back at my review of Vera Brosgol's first graphic novel, Anya's Ghost, and it is gushing! This is why I keep this blog: so I can refer back to books and remember how I felt about them. In 2011, I wrote that I couldn't wait for Brosgol's next book. It's been seven years and worth the wait to get Be Prepared, a fully realized memoir that is entertaining and relatable. 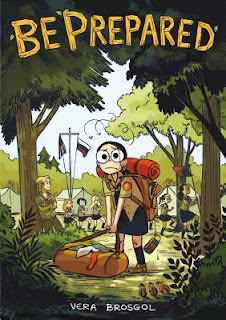 Nine-year-old Vera is too Russian and too poor to fit in with the other girls in her class, which is why she jumps at the opportunity to attend a Russian summer camp. Maybe she has finally found her people! That might have happened, if she wasn't put in a tent with teenagers, who immediately cast her aside. I almost can't blame them--a five year age difference is incredible and that is negligent on the camp's part! Everything that Vera had been looking forward to goes wrong, and there is no way she could be prepared for what summer camp entails. Similar to Anya's Ghost, this book has a limited color palette. The choice to use olive green as the only color makes the reader feel as if the whole book is set inside a tent. I like Brosgol's illustration style and Vera's huge eyes make her seem so vulnerable and young. I'm happy that the ending of the book sets up what must be a sequel. I hope we don't have to wait seven years to read it.